Nettuno is newly revamped by previous Delta Owner and creator Nino Marino. 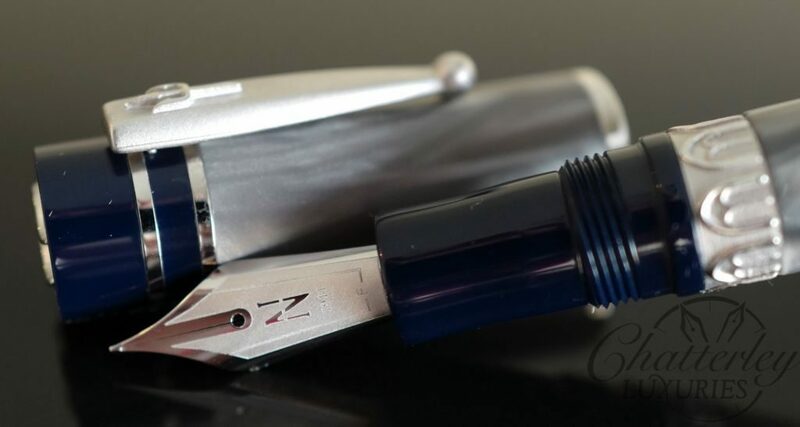 The world’s first Italian-manufactured fountain pen proudly displayed the Nettuno trademark. The city of Bologna became one of the most important spots in the country for fountain pen manufacturing thanks to Umberto Vecchietti. An advertisement from 1911 illustrated Neptune, the god of the sea himself, holding the pens as if they were his iconic trident. The model for the company’s logo was based on a famous statue of Neptune in one of Bologna’s squares, and would mark the foundation of this institution. Vecchietti and his friend Armando Simoni (the founder of Omas) began producing spare parts to repair the imported fountain pens of that time period. He had a workshop in Via S. Georgia, and then moved to Via Manzoni in 1929 to set up a wholesale stationary business. One of the first fountain pens from Nettuno was the Nettuno a Serbatoio, which was a regular safety pen produced in ebonite. Many lines had gold trim, and it was available in four sizes, including extra small, lady, regular, and oversize. Nettuno has always focused on introducing innovative production techniques and materials, and developing new styles and designs. The adventure is still strong today, and Nettuno 1911 is currently manufactured in the Maiora pen factory in idyllic Naples. Every pen offers the finest quality and workmanship, and guarantees a luxurious experience to all users. The 1911 Collection by Nettuno is inspired by a desire to revitalize one of the most ancient stories of the Italian pen. The passion and experience that went into this collection celebrates the dedication of old pen manufacturers who spent their lives crafting a world of treasured writing instruments. These pens were subjected to the rules of an entirely artisan production. Fountain, ballpoint, and rollerball pens capture lustrous rays of light due to the exotic materials at hand. Turned by hand from solid bars, the distinctive metal trimmings are plated with gold or rhodium, while surfaces are treated with infinite care. Each piece can be treasured by handwriting enthusiasts and aficionados alike as small pieces of luxury art.